Traditionally there has been a separation between the gun “self defense” culture and the martial arts “self defense” culture. Martial artists claim they could solve all self defense problems with a punch a kick or a submission and shooters believed most self defense issues could be solved with a quick draw and a double tap. Prior attempts to integrate the two disciplines have been awkward, at best! A quick search of police video, surveillance, and cell phone video on video hosting sites reveal, self defense incidents are primarily extremely close range. Criminals use verbal deception to shorten range and then attack. This often results in a standing grapple where the attacker and subject’s arms are entangled. The fight to draw a concealed handgun is often the determining factor in the outcome of the encounter. For the untrained, timing errors regarding the decision to access the firearm or a defensive knife are the norm. A bad timing decision often results in a fouled draw, loss of muzzle control, or dropping the firearm or defensive knife. Two innovations occurred in the 1990s which changed training and tactics and allowed for the integration of multiple self defense disciplines: Marking cartridges and mixed martial arts. Throughout history, warrior cultures trained with replicas of the arms they carried on the battlefield. Numerous attempts were made to simulate the modern handgun or carbine cartridge. In the late 1980s General Dynamics-Ordnance and Tactical Systems-Canada Inc. developed marking cartridges (Simunition) which allowed trainees to accurately shoot at human opponents using realistic firearms in contextual scenarios. The “bullet” of the marking cartage is soft plastic filled with a washable marking paint. The trajectory of the bullet path is accurate. This tool allowed police and military trainers to test tactics, techniques and procedures against fully resisting humans without harm. In November of 1993 the Gracie family, with financial backers, sponsored a tournament style, no holds barred, prize fight, to highlight their hybrid form of grappling martial arts commonly known as Brazilian Jiu-Jitsu (BJJ) or Gracie Jiu-jitsu. The Gracie’s modified Japanese Jiu-Jitsu and Judo and developed a devastatingly effective ground grappling art, like wrestling with chokes, strangles, and arm and leg joint locks. The tournament showcased fighters from different disciplines fighting a full contact match with no time limits, weight classes or time outs. Contestants could win by submitting the opponent with a joint lock, choke/strangle, or by knock out. A fighter could quit by submitting or tapping out to their opponent. The grappler, Royce Gracie, won the first Ultimate Fighting Championship (UFC1) tournament by submitting all his opponents on the ground. As the sport developed a universal rule set and time limits were adopted. Specific fighting sports survived the competitive, full contact, environment and a hybrid of BJJ, boxing, Thai Boxing, Judo, and wrestling was developed. The sport of Mixed Martial is continually innovating and changing but the core arts remain. MMA, with an emphasis on BJJ and standing grappling, derived from Greco Roman wrestling, is the ideal base for self defense and the ideal platform for multiple weapons systems. Both innovations in unarmed combat and firearms training allowed for pressure testing tactics and techniques. Pressure testing allows two or more opponents to have a realistic fight, full contact, with minimal rules, in a competitive environment. This testing technique adheres to the scientific method and quickly rewards superior technique and gear. Through thousands of realistic evolutions, we have identified tactics, techniques, and gear which will allow average people to dominate in close quarters altercations. 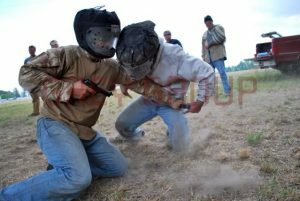 These techniques are taught to elite undercover law enforcement, military personnel deployed to non-permissive environments, and civilian concealed carry holders. The skills are scalable and anyone, regardless of age or athletic background. Everything we teach at the Range at 355 is pressure tested. We use mixed martial arts (MMA) as a delivery system and cutting edge firearms and defensive knife techniques to train our students to be multi-disciplinary self defense practitioners. The firearm is a tool; it is not a panacea or solution for all self defense problems. 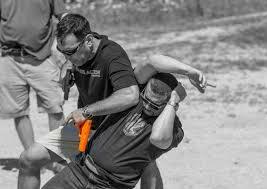 Concealed carry license holders should be verbally agile enough to manage and deescalate potentially violent situations, daily carry the tools to prevail in a violent encounter, have the ability to effectively use the tools they carry, and have tools and techniques to manage injuries (first aid). We are offering classes in many of these disciplines and have plans to expand our classes to cover the full spectrum of self defense. ← Walk this way…does the way you walk target you for violent criminal perdition? Walk this way…does the way you walk target you for violent criminal perdition?